Five baby black-crowned night herons were injured but are now resting at a Bay Area bird rescue center, after the tree they were on was trimmed because their flock was defecating all over mail trucks in Oakland. Fairfield-based International Bird Rescue spokesman Andrew Harmon told NBC Bay Area on Wednesday that the chicks, all younger than three weeks old, are in good condition resting in incubators, after one suffered a broken bill and other injuries over the weekend. He said he is optimistic about their recovery, but isn't sure at this point if they will fly again. But both the California Fish and Game and the U.S. Postal Service denied a report in the San Francisco Chronicle that the shorebirds had been "massacred by a wood chipper" on Saturday. The newspaper also reported that the deaths were being investigated because the birds are protected by state and federal laws. Still, the U.S. Fish and Wildlife department took over the investigation, and spokesman Steve Martarano said the wood chipper will be inspected on Thursday. 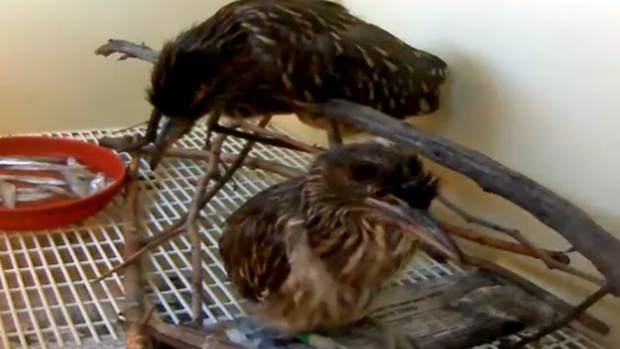 Five baby black-crowned night herons were injured but are now resting at a Bay Area bird rescue center, after the tree they were on was trimmed because their flock was defecating all over mail trucks in Oakland. Jean Elle reports. Earlier, Calif. Fish and Game spokesman Andrew Hughan said there is no evidence as of yet that a "feathery massacre of herons" took place at the Oakland Civic Center post office, where a tree trimming service was cutting back the branches of a tree popular with the herons. Still, he said, investigators aren't sure whether or not any birds died as a result. There is the possibility that one or two birds died, he said, but there after talking to investigators, it does not appear that a bunch of herons, en masse, died in a wood chipper. "I've talked to four witnesses," he said, and the birds "weren't thrown into any chipper." The Chronicle showed one photograph of what appeared to be a dead bird hanging from a tree branch along Alice Street. Hughan said that photo is being investigated. U.S. Postal Service spokesman Augustine Ruiz did acknowledge, however, that the herons had been "pooping on trucks and windshields," which was becoming a problem for postal drivers. The agency hired Campos Greenview Landscape and Tree Service in Pittsburg to perform the trimming. Ruiz said he was told the tree trimmers moved the nest of bird out of harm's way while they cut back the trees. "The birds were actually being saved, not harmed," Ruiz said. "I think people heard the chirping and jumped to conclusions."